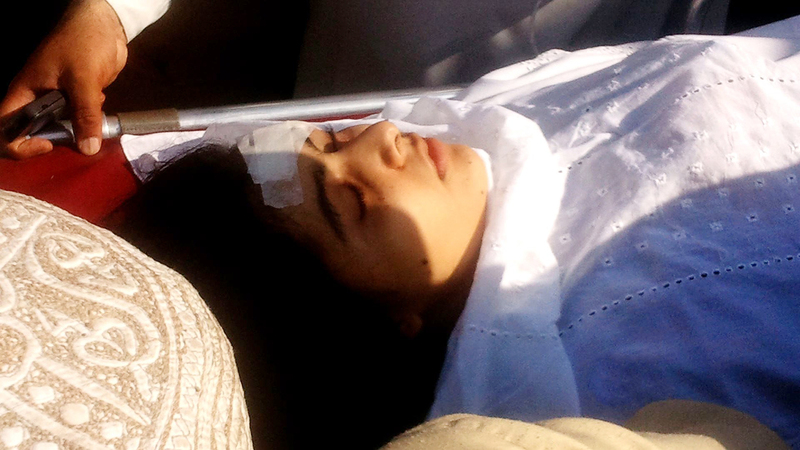 ISLAMABAD The father of a 15-year-old Pakistani activist girl who was shot and wounded by a Taliban gunman vowed Thursday that she would return home after finishing medical treatment abroad despite new insurgent threats against her. Since she was shot on Oct. 9 in northwestern Pakistan, Malala has become a hero both at home and internationally, although her work in speaking out against Taliban atrocities and advocating for girls' education has long been respected and known beyond her native Swat Valley. Suspicious Malala visitors likely "over-curious"
The comments by her father, Ziauddin Yousufzai, were recorded by Pakistani state television before he and Malala's brothers and mother boarded a flight to Birmingham, England, to see the young woman where she is being treated at a hospital. It was the first time he has spoken publicly since the shooting. "I have seen doomsday and survived, you might say," Ziauddin told The Telegraph newspaper in a separate interview before departing for Birmingham. "Malala has been honored by the nation by the world, by people of all classes of all creeds of all colors. I am grateful for that." He added, though, that his current focus was solely on Malala's health. "The only priority now is the life of my daughter and her total rehabilitation ... I don't need any awards," he told the newspaper, "I need my daughter." At the age of 11, Malala began writing a blog under a pseudonym for the BBC about life under the Taliban in Swat. After the military ousted the militants in 2009, she began publicly speaking out about the need for girls' education. She appeared frequently in the media and was given one of the country's highest civilian honors for her bravery. A Taliban gunman shot her in the neck and head as she was in a school bus on her way home from school in the Swat Valley city of Mingora. Two other girls were injured in the attack. She was airlifted to the hospital in Britain on Oct. 15. The Taliban have vowed to kill her, raising questions about whether it would be safe for her to return but her father dispelled reports the family might seek asylum abroad. "I first laughed at it because all of our sacrifices, my personal (sacrifices), or this attack on my daughter, cannot have such a cheap purpose that we would go to some other country and live the rest of our life there," he said, speaking in Urdu. The Taliban said they targeted Malala because she promotes "Western thinking," and have vowed to finish the job in the future. Malala's father spoke alongside Interior Minister Rehman Malik at the minister's Islamabad office. Malik promised that the government would protect Malala and her family when they returned. Malik said Malala had asked her father to bring some of her school books with him when he goes to Britain. Malala has started talking and has spoken to both of her parents by phone, the interior minister said. The 15-year-old is being treated at Queen Elizabeth Hospital in Birmingham in central England, which has a major trauma center specializing in treating severe gunshot wounds, major head injuries and road accident victims. It is also home to the Royal Center for Defense Medicine, the primary receiving unit for military casualties returning from overseas. The medical team caring for Malala at Birmingham hospital said in a statement Thursday that she was comfortable and continued to respond well to treatment. Last Friday, the hospital released the first photographs of Malala since the shooting, showing her lying in her hospital bed, and said she was able to stand with help and write.